The main component which gives structure to your home is the walls. In wood frame construction, the weight of the roof, shingles, Standing rain water, the weight of the roof, snow, and shingles all add weight to the roof on wood construction, which results in a compressive force to the walls from exerting downward forces. Imposing lateral forces on the walls of the homes are created from gusts and high winds from storms. A “shearing force” can be generated by the lateral forces that distort the walls. To be able to withstand these forces and loads, a home’s walls are required by building codes to be designed in a certain way. Walls are nevertheless sometimes built to the minimum standards, so sounds of creaking and shaking that are created through movement or during high winds can often be heard. 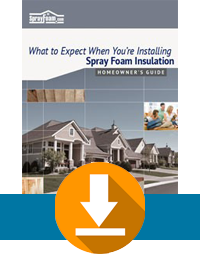 To reinforce both the studs and the exterior sheathing inside the walls, higher density closed-cell spray foam is recommended, for it adheres fully to both. There will be less wall movement due to vibration, wind, and occupant activity with the added rigidity that closed-cell spray foam provides. “Racking events” such as hurricanes or high wind situations can also be avoided with closed-cell SPF because your walls will have greater resistance than what is required by building code. Adding structural strength to the building is another benefit of an SPF application. SPF filled walls could add from 75 to 200 percent racking strength to walls of vinyl siding, gypsum board, light gauge metal, or OSB plywood, as NAHB Research has demonstrated.